Daniele Scolari was born in Cremona in 1961. He attended the Cremona International Violin-Making School, where he was a pupil of Master Giobatta Morassi. He graduated in 1979, and since 1982 he has been working with his brother Giorgio, developing his personal style. His instruments are inspired by the classical Cremonese school, in particular by models of Stradivarius and Guarneri, utilizing only materials of the highest quality. His violins, violas and cellos are appreciated not only in Italy, but also in Japan, the United Kingdom, and the United States, for his care in details and his personalized style as well as for his characteristic varnish which is of a brownish-orange colour. He participated in the Bagnacavallo Competitions, winning the gold medal for the best varnish in 1984, a silver medal for one of his violins in 1986 and two bronze medals for a violin and a viola in 1988. In the Cremona Triennial Competitions he has always received superior results. 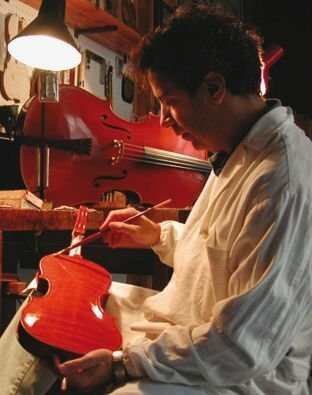 Since 1996 he has been teaching in the International School of Violin-making of Cremona. A passionate music lover, he is also a director of a vocal and instrumental group with which he is as spirited in searching for novelties and enrichments, as he is while building violins. His goal is to unite these two art-forms through the expression of feelings and inner sensations, which provide sound, colour and form to his own personality.